These handy little devices represent the XB product line created for the defense and security industries. Originally a “modification” to our 82-2 harness board product, these wire piercing devices are fully insulated on the exterior and offer a screw down clamp to ensure a secure and solid connection upon engagement with the wire. Once the XB is hooked on you can rest assured that it isn’t coming off until you decide to physically unclamp the device. The V-grove above the nailbed allows for various sized wire dimensions and ensures they can easily be directed over the wire bed for optimal connection. We understand there is often no room for technician error in the field- and this product was made with that requirement in mind. 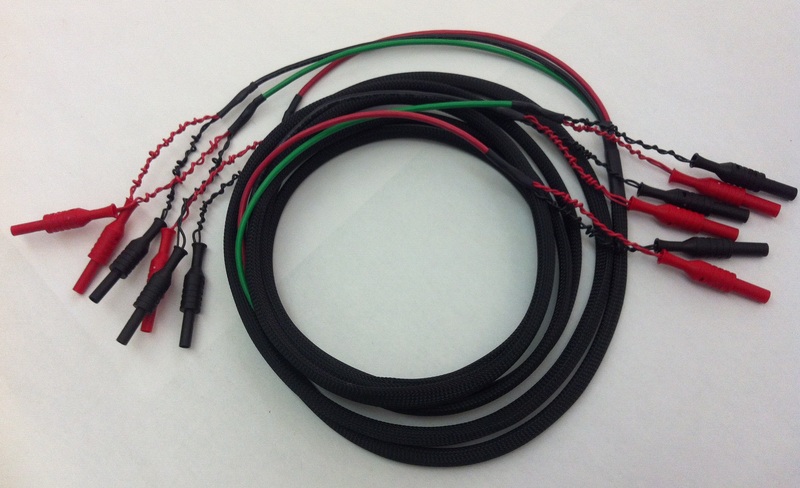 The XB parts are available in red, yellow and black with factory installed leads. 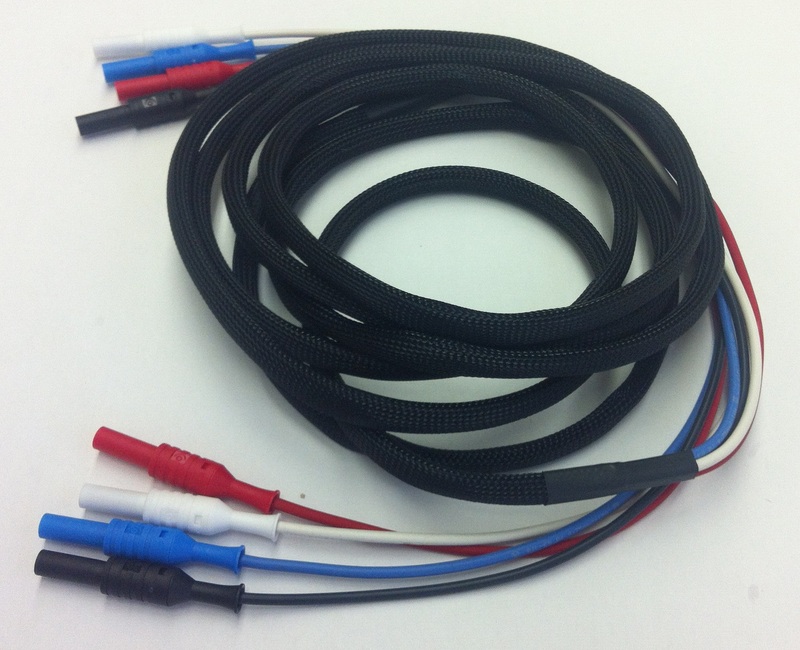 The most preferred lead is an 18 gauge PVC wire to a shrouded banana plug, but contact us for various connector options. This product is also available as a lead set or kit for specific industry requirements. A large multi-state Mid-West power company approached E-Z-Hook to see if we could manufacture custom leads using the copper blade version of our macro-hook test connectors, model XH and XHL. The leads would ultimately be used by plant technicians testing power and required a secure right angle bend on the hooks. Included in the requirement was the ability to close the power circuit after checking that the hook connection was properly connected. We designed in a “key” concept they requested. It was built into the jumper, allowing the user to close the circuit after the connection was verified as good. Additionally we designed jumpers with a similar fused “key” for further security which was required in some test environments. 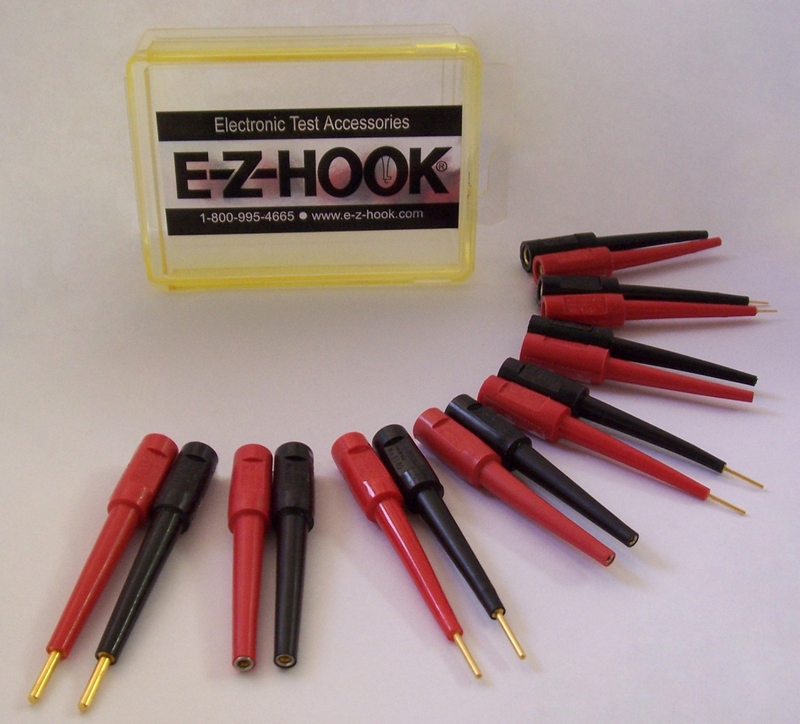 In the end, E-Z-Hook created four variations of leads, some containing a 3 AMP, 250 Volt fuse. 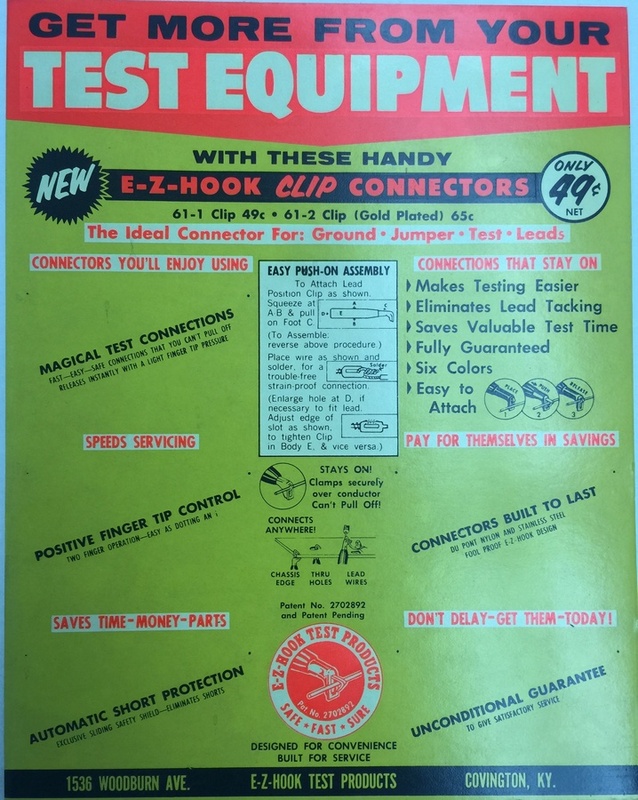 Since 1956 E-Z-Hook has been making quality test products and accessories. Sure we have changed, grown, and added product lines. As required we have altered our manufacturing process to ensure our product line adheres to regulations such as REACH, ROHS, and the Dodd-Frank Conflict Mineral Act. We no longer operate out of a personal garage in Kentucky like we did in 1956, but in our own 24,000 square foot manufacturing plant in Arcadia, California. Instead of one person designing and making the products, we have a team of employees, many with over 25 years of experience. OR ARE WE REALLY JUST THE SAME? It caught my attention while I was filing away old marketing materials that our marketing message was the same. How funny. In hearing this you might think, yikes, 60 years and still saying the same thing? Yes, in fact, 60 years and we are still saying the same thing. It’s not because our marketing department has been lazy, or ineffective, or void of fresh ideas. It’s because 60 years ago our marketing focus was on the attributes of our products. Those product attributes haven’t changed, and we are proud of that! E-Z-Hook has a long history of working with clients who need assistance developing a custom product to fulfill their needs. From the outside the solutions was simple – a box. It was the inside components, which included fuses and switches, that made the little box more complicated. Working closely with the client E-Z-Hook developed 3 separate prototypes that could work with the clients test jumper applications. 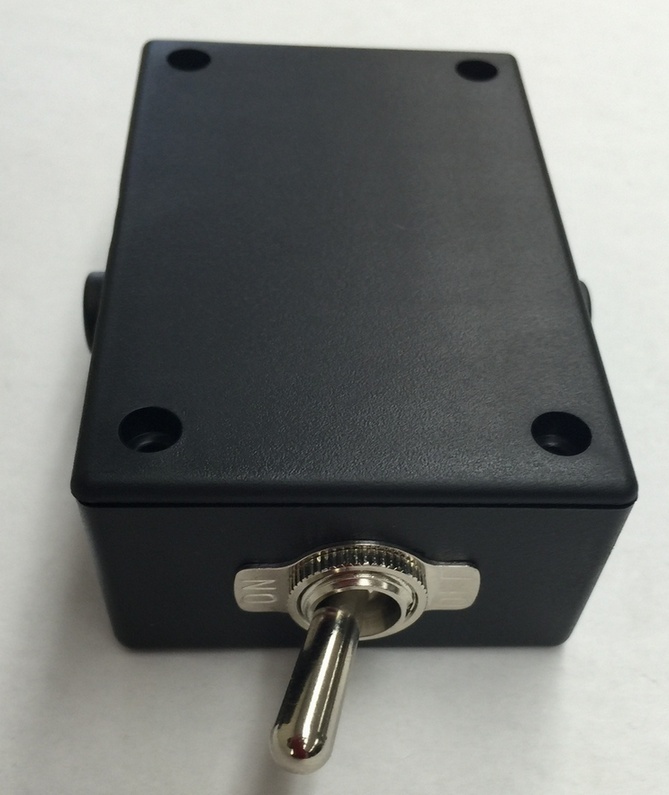 The final solution addressed the clients’ needs for a Test Jumper Junction Box. The finished product used both standard and custom components. 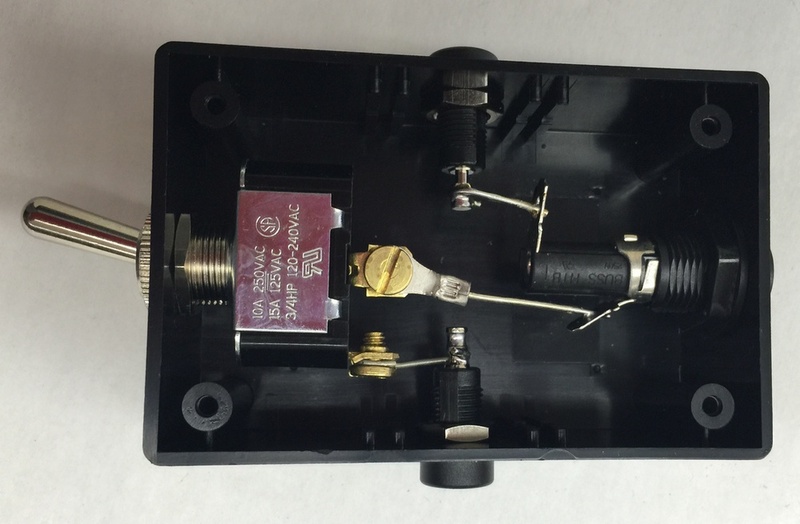 The design included a toggle switch or momentary switch that allowed fuse capabilities to be switched on or off with the various test applications. In the end, the solution was “in the box”, a small plastic box. The device allowed the customer to supply their technicians with a simply solution which allowed them to easily amplify their testing capabilities. A single custom solution provided a complete kit. 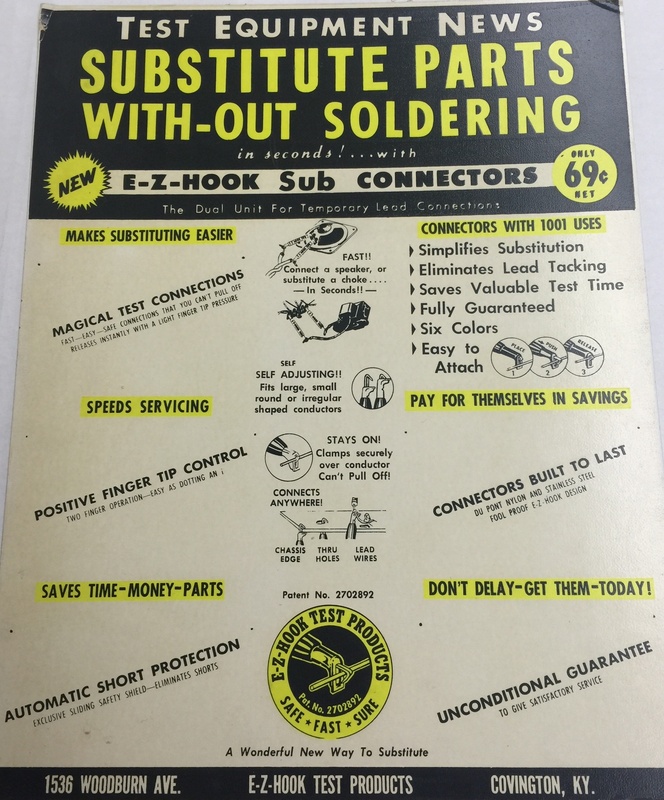 82-1 Harness Board Connector Makes Wire Testing E-Z! In response to many customer inquiries, E-Z-Hook has developed a new product allowing for quick release of wires after testing. This new design, our 82-1 series, is based off our popular 82-2 product line. The 82-2 product has a bed of piercing nails allowing for testing of wire connections without requiring any wire stripping. The clamp or lever holds the wire against the bed of nails, forcing the needles into the wire so that contact can be made through the insulation. 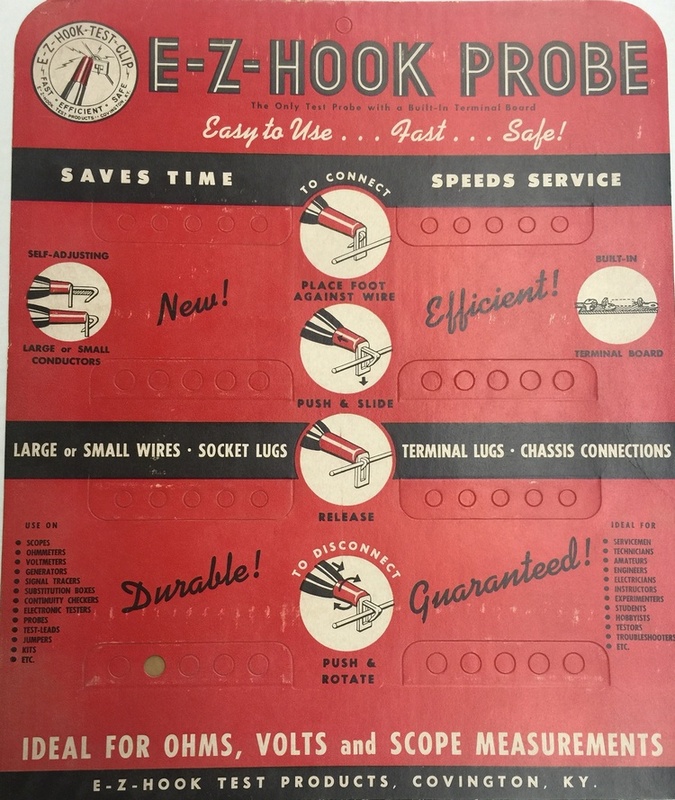 In many customer applications, the wire being used was already pre-striped. While pre-striped wire can be used with the 82-2, we recognized that the same “insulation piercing” needle bed wasn’t a requirement for positive connectivity. In talking with clients using pre-stripped wire an important feature was easy wire removal after testing. The 82-2 piercing design requires the clamp to be opened or released to free the wire and disengage from the nails. For pre-striped wire ends the nails aren’t needed to create a connection. The individual wires tended to get caught or stuck in the bed of nails, which lengthened the time requirements for the testing process. “Voila,” the flat pad 82-1 product! We listened to our customer feedback and recognized we could provide a better solution specific to environments using pre-stripped wire. We designed a “flat metal pad” harness connector. This flat metal pad provides contact with the striped wire once the clamp is closed. Unlike the bed of needles, the wire removal from the connection is as easy as simply pulling on the wires. The clamp or lever does not need to be lifted to free the wire. When multiple wire connections are being tested this new design saves valuable time. 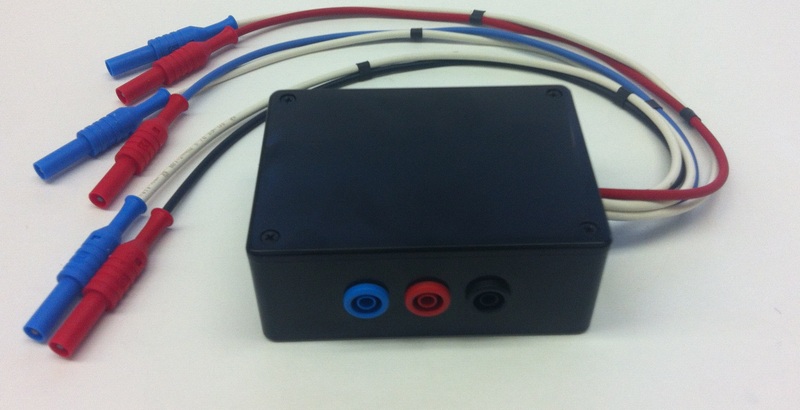 The new harness board connector, 82-1, will be available at the beginning of January, 2016. Picture coming soon! The same customer required a similarly Panel Mounted but with a Shrouded Banana Plug. We quickly drew up plans for a mounting of the very same type and dimensions as the shrouded socket so that the parts could be interchangeable. Engineering drawings of the proposed product as well as a physical sample of the product were provided to the customer. All of this was done for the customer within the same day! 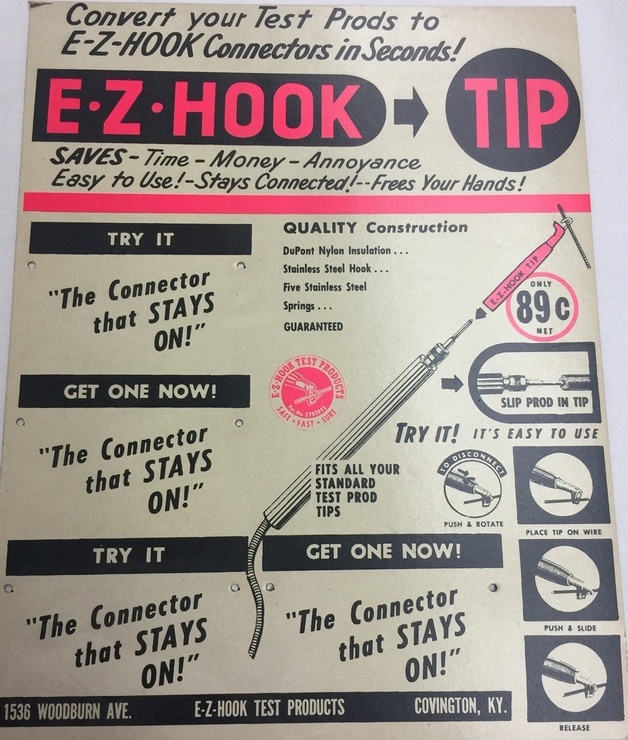 Come to E-Z-Hook for your requirements and see what we can do for you. E-Z-Hook just doesn’t like saying no. Come to us with your special requests. Your unique test and measurement assembly requirements. We love the challenge of providing you with exactly what you need , building your custom test assembly from the thousands of combinations we can provide. Give us a call and see what we can do for you, because we just can’t say no to your challenging test equipment requirements. Check out our What’s New section of our website to see examples of what we love to do…..customized solutions. We love blue. 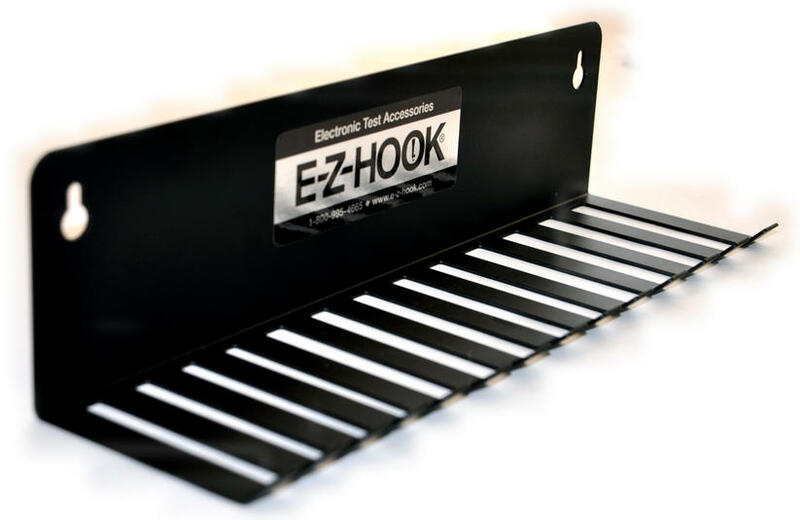 We use the color throughout our E-Z-Hook website, on our product labels that hang in retail stores, and to add a splash of color to our automotive test lead boxes. We loved the color so much that when we designed wall brackets for holding test leads and cables we had it powder coated in a brillant blue. That was back in the 80’s. It’s now first quarter of 2014 and we are excited about our wall bracket relaunch. Here is a sneak peak at the new wall bracket. It has the same great design, just a new look. Get ready to see this sleak and sophisticated matte black product available later in the year. Loved the retro blue colored wall bracket? Better get your order in soon as this color will soon be obsolete! Checkout the latest custom products we made for a division of Hewlett Packard.